Hamstring stretches are very important for our overall health, as it reduces lower back pain and gives us strong and lean hamstrings that will help with our lower body range of motion. There are three hamstring muscles running from our hips to our knees. These muscles are used every day in every movement of our legs as hamstrings control the bending of the knee. Hamstring sports injuries are very common to athletes like soccer players. Many athletes learn the importance of hamstring stretching through physical therapy and hamstring injury rehab. Proper hamstring muscle stretching play an even more important role for soccer players, or similar sport athletes, where running with sudden change of speed and direction puts hamstring muscles under a lot of pressure. In order to reduce the risk of injury when playing soccer or similar sports, it is vitally important to stretch the hamstring muscles before, and after the activity. Stretching the hamstrings also helps with reducing, or completely eliminating lower back pain. Proper hamstring stretches before game or training will increase flexibility, reduce lower back pain and the chance of hamstring injury. 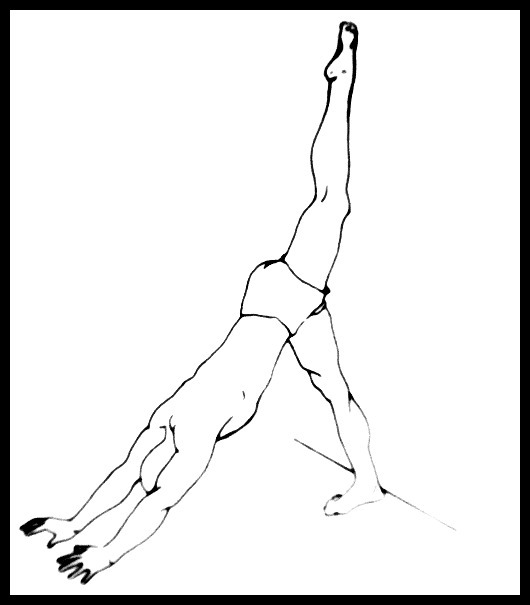 Below you can find illustrated stretching exercises for the hamstring muscles. 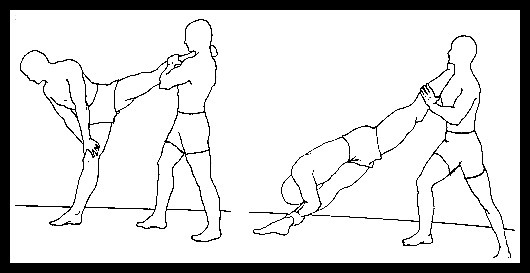 Some of these stretches you can do on your own and some require a partner or a prop. 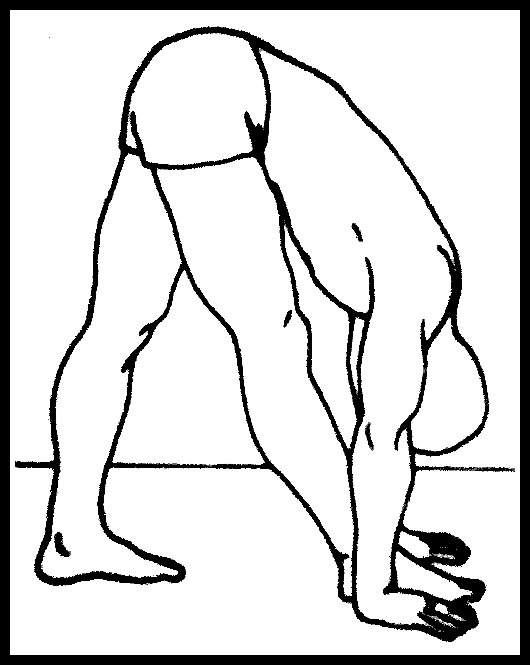 -Sit on the floor with one leg straight in front of you while you bend the other leg inside as shown in the picture. -Keep the extended leg straight while pushing down on the floor with your bent leg. -Slowly lower your upper torso down and try to touch the extended leg's knee with your head. - Sit on a bench or a table with one leg straight and the oposite leg on the floor. - Place your hands on your head, extend your upper back and slowly lower your upper torso down towards the extended leg's thigh. - Keep the extended leg straight on the table. - Find a door frame and lie down on your back with your hips about a foot back from the door. - Raise one leg against the door frame while extending the opposite leg and keeping it straight. 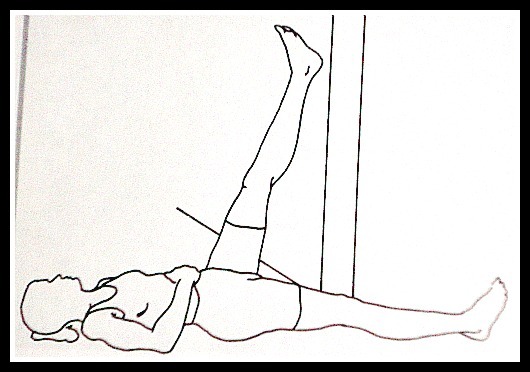 - Now stretch the hamstring muscles by sliding forward with your hips or lifting the leg away from the door frame. - Remember to try and keep both of your legs straight to reach maximum stretch in the hamstring. - Hold the stretch for 8 - 10 seconds and do 3 sets of 5 repetitions. * Lie on your back with knees bent and heels close to your but. * Extend one leg upward and slowly pull it towards you holding it for 8 seconds. * Keep your extended leg straight. * Do 3 sets of 5 repetitions for each leg. * Lie on your back and keep your legs straight. * Take a longer towel and put it around the instep of one foot. 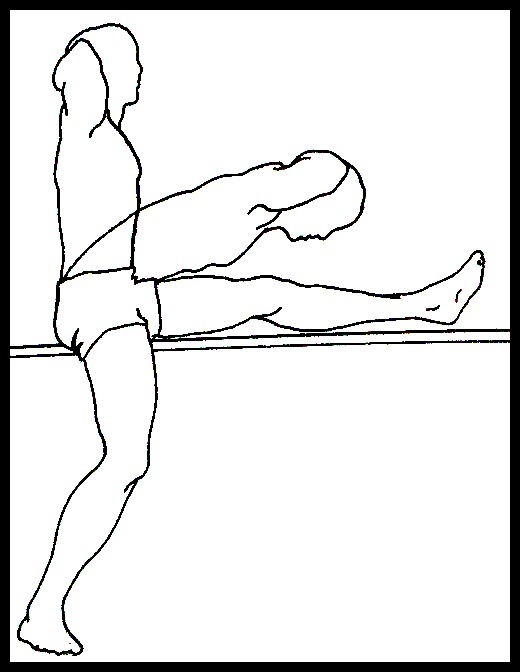 * Extend the leg upward and pull it towards yourself holding each repetition for 5-8 seconds. * Keep your legs as straight as you can. * Sit on the floor with your palms down behind your hips for support and legs extended straight in front of you. * Bend one knee and grab the instep of foot with one hand. * Start extending your bent leg up holding the hamstring stretch for 5-8 seconds. * Find a platform or a table close to your hip height. * Place one leg up on the platform keeping your knees straight. * Slowly bend forward extending your back and trying you reach the thigh with your abdomen. 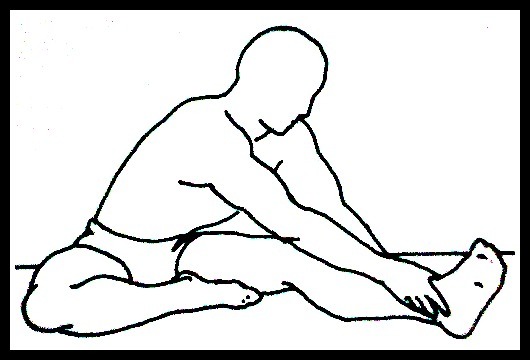 * Keep your legs as straight as you can and hold the stretch for 5-8 seconds for one hamstring stretch repetition. * Keep your knees straight and stand with one foot in front of the other forming a gap of about 1 ft or 12 inches. * Slowly bend forward and towards the forward leg trying to touch the floor or the ankles while keeping both legs straight. * Stand next to a wall with your back about 3 ft away from the wall. 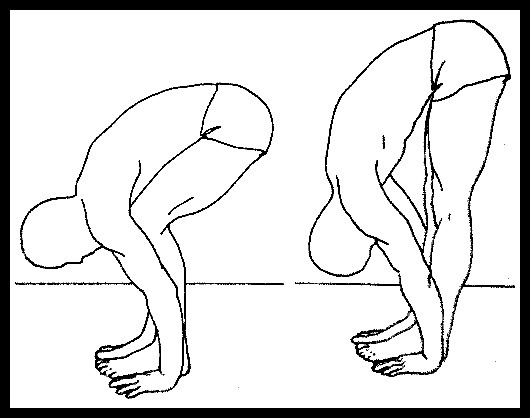 * Bend over and place your hands on the floor for support while raising one leg up and against the wall. 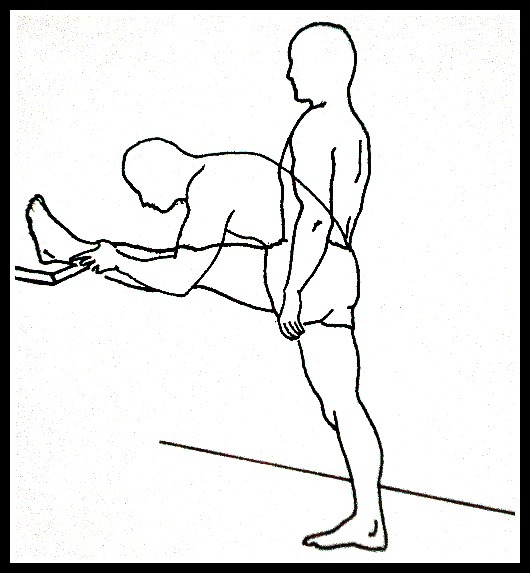 * Keep your foot pointing forward while sliding your raised leg upward against the wall. * Keep your hips and feet straight and hold the stretch for 5-8 seconds. * Lie on your back and raise one leg while keeping the hips square. * Your partner should anchor your extended leg straight down at the knee while resting the other leg on his/her shoulder. * Your partner should slowly now raise your leg upward keeping it straight at the knee. * Hold the stretch for 10 seconds for one repetition. * Stand against the wall facing your partner. * With your back and legs straight against the wall raise one leg and have your partner grasp it with both hands above your ankle. * Try and keep your hips squared and legs straight. * Hold the stretch for 8 seconds for one repetition. 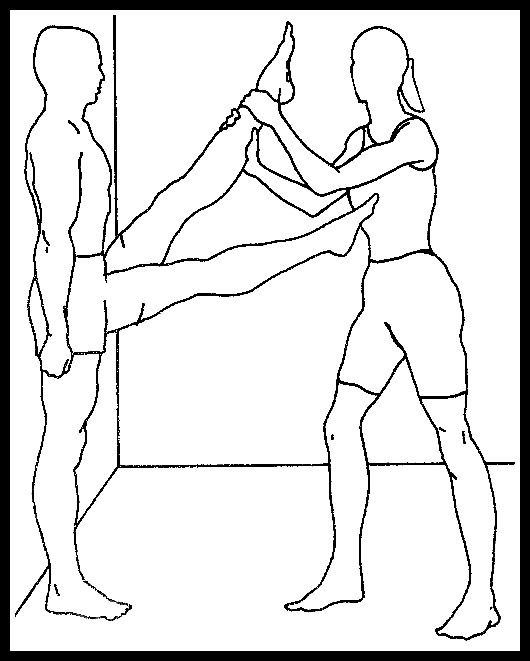 * Face your partner and from the standing position place one leg on your partners shoulder so that it rests just above the ankle. * Slowly start bending forward towards your knee while your partner steps backwards. * Turn away from your partner and slowly lean towad your ankle as your partner steps backward. * Keep your legs straight and hold the stretch for 8 seconds to count as one repetition. * Sit on the floor with both legs extended in front of you. 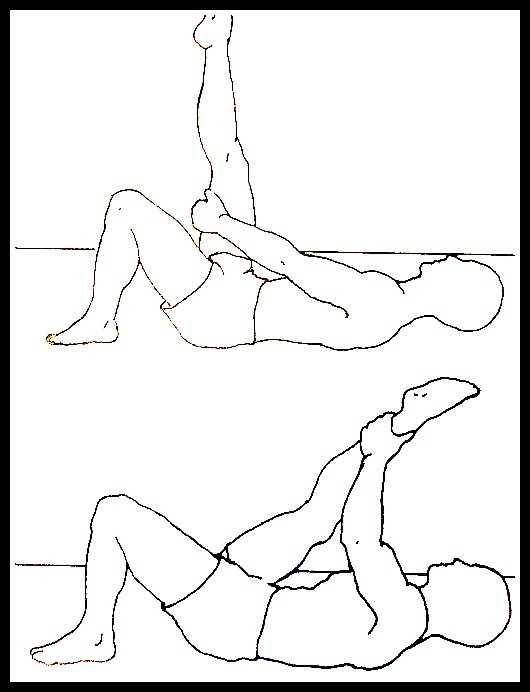 * Keep your legs straight, extend your upper back and slowly lean forward trying to touch your thighs with your abdomen. * Sit on the floor with both legs spread and extended in front of you. * Keep your legs straight, extend your upper back and slowly lean forward trying to reach as far forward with your hands as possible. * Bend your knees so you can bring your chest closer to the knees until your palms are flat on the floor. * Slowly start straightening your legs and stop when you feel excess tension. 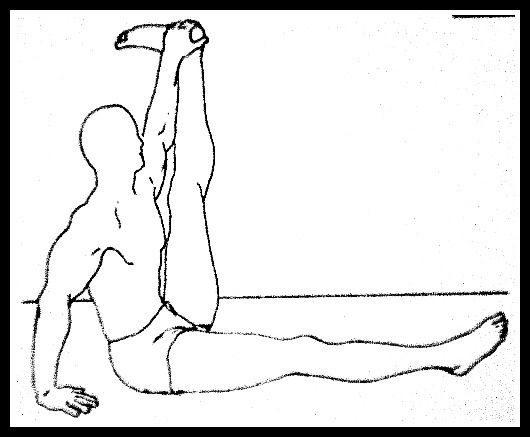 * Keep your legs as straight as you can and hold the stretch for 8 seconds to count as one repetition. * Stand with your legs spread wide apart and your knees straight. * Slowly start bending down at your hips so that you can grasp your ankles with your hands. * Pull your chest closer inside and hold the stretch for 8 seconds to count as one repetition. * Do 3 sets of 5 repetitions. * Stand with your legs spread apart about 1 foot or shoulder to shoulder length. * Interlock your fingers behind your head. * Extend your upper back and slowly bend down at the hips while keeping your legs straight. * Hold the stretch for 8 seconds counting one repetition. You can do this stretching exercise in many different ways by simply doing different things with your hands. You can try and place your palms on the floor, grasp your ankles, put your hands above your head, touch your toes etc. * Sit down on the floor with your legs extended in front of you. * Your partner will do the same with his feet braced against your feet. * Get a towel and take one end while your partner takes the other end of the towel. * Extend your upper back and start leaning forward at your hips while keeping your legs straight. * Your partner will lean backwards pulling the towel and bringing you more down towards your knees. * Sit down on the floor with your legs extended in front of you while your partner stands behind your back with one hand on your upper back and the other hand on your lower back. 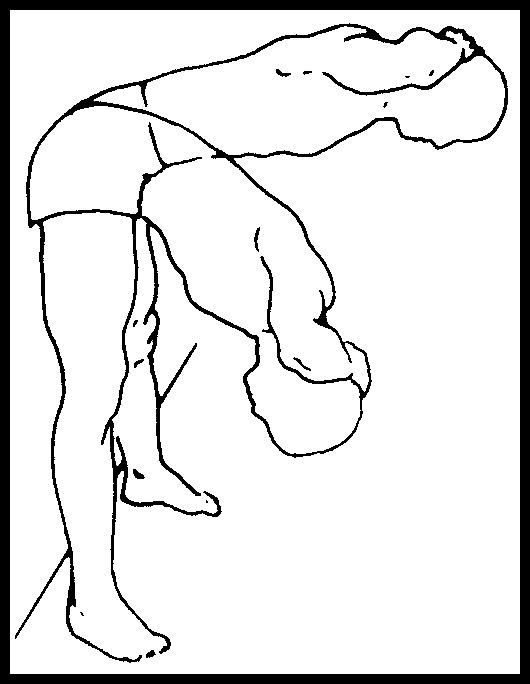 * Extend your upper back and start leaning forward at the hips as your partner pushes gently from the back. * Hold the stretch for 8 seconds counting it as one repetition. There you have several different hamstring stretching exercises to keep your hamstrings lean, strong and healthy. Remember to breathe by inhaling through your nose and exhaling out the mouth when stretching. Consistency is the key to getting hamstrings strong an lean. Fore more information on stretching the hamstrings visit Methods of Stretching Hamstrings.